Since 2009, OpenEnergyMonitor.org has been the hub for a community effort to build open-source tools that make energy use more visible and accessible to homeowners. The team there has compiled resources for monitoring AC circuits, solar panels, heat pumps, and environmental sensors. 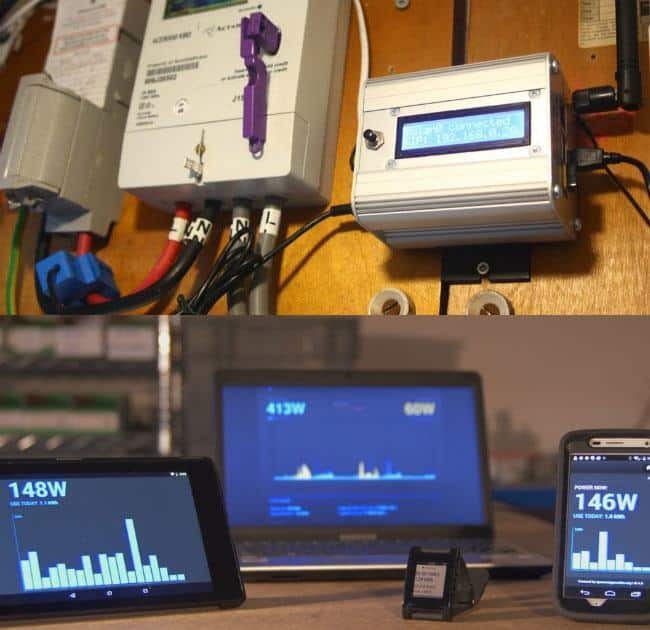 The project has also developed an open-source content management system called emoncms for displaying that data on the web, and runs an online shop selling various components for DIYers to build their own energy monitoring systems. emonPi collects a bunch of that hardware into a single package and preloads it with software for the most common uses. At the core is a Raspberry Pi 2, plus an Arduino-based “shield” designed by the OpenEnergyMonitor team that adds the inputs and outputs needed for energy monitoring. It’s all contained in an aluminum case that exposes sockets for an AC power supply, Ethernet and USB cables, and other ports for plugging in sensors and peripherals. Installed near a home’s utility meter, solar photovoltaic cell or heat pump, emonPi uses a clip-on current sensor to detect the flow of electricity through the wires. It can also monitor temperature and humidity through wired or wireless sensor nodes. It transmits through Ethernet or Wi-Fi to the emoncms software, so users can view real-time and historical data and graphs on a web-based dashboard. emoncms can run locally on the emonPi, or users can sign up for a free cloud-hosted account. The emonPi’s designers have committed to making the product as ethically and sustainably as possible — from sourcing conflict-free materials, to assembling components locally in the U.K., to building the device’s enclosure from fully recyclable aluminum. They’re raising funds for production on Kickstarter through April 20, and plan to ship in May. Backers can choose to receive a pre-assembled emonPi, which is essentially a plug-and-play system, or take a page from OpenEnergyMonitor’s open-source philosophy and order one of the unassembled kits to make it easier to tinker with and hack in their own customizations.